Traditional floor screed is mixed at a factory for both flooring or roofing and gives excellent cement dispersion, with greater compressive strength over the total floor area. It also stays workable for anything up to 12 hours. Super strong screeds, perfect for use in offices, industrial settings and even hospitals, have been created to meet the growing demand for sand and cement screeds incorporating polypropylene fibres. These fibres improve the cohesion plus also control any potential cracking caused by stresses. Fast drying high density screeds are perfect for most common floor finishes and allow the floor space to be used alot earlier. It is easy to work, provides a higher strength and scratch resistant finish, and can be used on a wide variety of bases. The High Density floors are extremely effective on floors subject to alot of work or traffic and provide good sound insulation, thermal insulation and weight reduction applications. SBR Polymer Modified screed has increased toughness and bond properties thanks to the inclusion of a synthetic polymer resin. It minimises shrinkage or cracking, permerability is reduced and flexural strength is improved. These screeds can provide greater performance in thinner applications when normal thickness could appear to be problematic. Flowing screed has a number of benefits worth considering. It has a high quality surface finish that reduces cracking and curling. A reduced need for construction joints or reinforcement. It is ideal for use in all warm water underfloor heating applications. Foot traffic can start within 24 to 48 hours and partitions constructed 7 days after installing. Great compressive strengths up to CA25F4/mm (BRE Test Category A to Bs8204) BSEN 12813. Up to 2000m squared can be installed every day. Environmentally friendly product. Does not harbour bacteria due to being protein free. Reduce thickness means greater weight saving. How quickly can you walk on the floor? 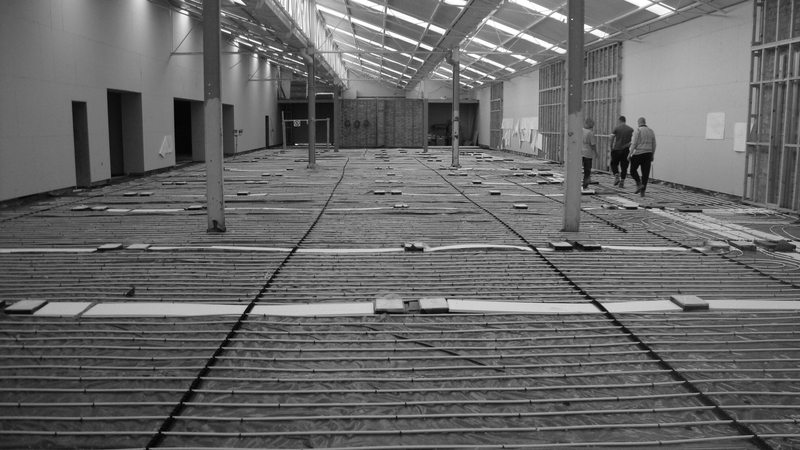 Insulated profile of the floor panels reduced the volume of screed on the floor to provide a system with low thermal mass, producing better and faster transfer of heat. Silent and invisible system - integrated safely within the floor. Stable heat profile - reduces unwanted air movement and dust circulation plus the occupied area of the building is heated. Low maintenance - embedded within the floor, maintenance is simple and removes the need for complicated and often dangerous servicing of other systems at a high level. Hard wearing - able to withstand high static and dynamic loads. Strong fixing clips secure the pipes in the perfect position to ensure full encapsulation within the screed or concrete. Pre-formed grid ensures accurate placing of pipes. Sub-base, clean and clear of any loose debris. Lay polythene and fix perimetre edging strip. Tape down all joints and pvc apron on perimeter edging strip to ensure there will be no grout loss. Set-up floor levels using self levelling lazer and thread level indicators. Finish and close surface using dappler bars.